Our number one private tour from Paris, Le Havre, Honfleur and Cherbourg is our D-Day Normandy Tours. You may elect to do a customized Normandy tour or do our standard private D Day tours. The Normandy tours may cover historic landing beaches like Omaha beach, Utah or Juno beach. Standard Normandy tours include Normandy’s landing beaches, Arromanches, Pointe du Hoc and the American Cemetery. Your guided D-Day Normandy tours may also include Honfleur, Sainte Mere Eglise, Bayeux, Mont St. Michel, Trouville, Deauville or Rouen. Another really nice Normandy tours is The Villages of Normandy. Our cider and cheese tasting tour in Normandy takes you along the apple orchards and dairy farms of the “cider and cheese routes.” Traveling between small villages in Normandy, you will have a chance to sample the local Camembert and hard cider and get a behind-the-scenes tour of their production. Contact us to customize your own day tour of Normandy. We offer private, custom Normandy tours, all of which are private tours for you and your group. All our Normandy private tours, D Day tours Normandy are customized with your goals in mind. Custom tours of Normandy for private groups, couples, families are designed according to our clients specifications. We deliver custom tours of Normandy and other destinations in France. Well Arranged Travel is the leading specialist of Normandy tours for various Normandy private tours. Call or send us an email for more information. Let Well Arranged Travel craft an upscale or luxury Normandy vacation. Whether you are planning a family vacation in Normandy, a honeymoon, solo or group trip, we can arrange the perfect Normandy vacation for you. We will secure your Normandy hotel, train tickets, airport transfers, private car service and custom design an itinerary with private tours in Normandy to satisfy your individual travel needs. Interested in a custom vacation in Normandy? Contact us for an immediate consultation. Fully escorted Normandy tours are also available. You will travel from the shores of your port of call to Normandy’s D-Day landing beaches with our expert Normandy tour guide. We offer private Normandy shore excursions or Normandy private tours from all the ports. We offer day trips or shore excursions from Cherbourg, Le Havre, Caen, Calais and Honfleur with our private tours of D Day Normandy, Paris, Mont St. Michel, Versailles, Giverny, Bayeux, St. Lo, the cider and cheese routes and more. All our guided Normandy tours are custom, private tours. If you want to linger in Normandy a few days (two to three days or longer), we can arrange a mini tour of Normandy from Calais, Loire, Paris or other parts of France or even England. We will organize your Normandy trip from start to finish to include your transportation, private tours, meals and lodging. Bayeux is a great base for exploring Normandy; we can arrange a few perfect days in the Normandy region, as we can design a Normandy custom vacation just as you prefer. We can set up guided private tours of Normandy, D-Day tours, Normandy landmarks, the historic Bayeux tapestry, Sainte Mère Eglise, the port towns of Honfleur and Deauville, Rouen, Mont St. Michel, and more. Three things sum up Normandy – Camembert, cider and cows. Spread along the Channel coastline between Brittany and the far reaches of northeast France, Normandy is where the green, pleasant French countryside smacks hard into the rolling waves of La Manche (the Channel). It’s a place of churned butter and soft runny cheese, where broad fields and dry-stone farmhouses perch on the edge of chalk-white cliffs, and the salty tang of the sea is in the air. Ever since the armies of William the Conqueror set sail from its shores in 1066, Normandy has had a pivotal role in European history. It was the frontier for Anglo-French hostilities for much of the Hundred Years’ War, and later became the crucible of impressionist art, but during the D-Day landings in 1944 Normandy sealed its place in the history books. 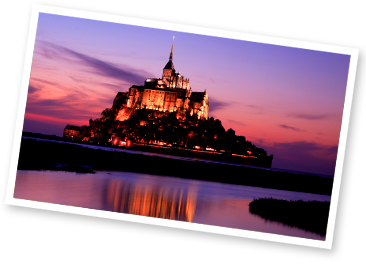 History has certainly left its mark on the landscape, which is dotted with sturdy castles and stunning cathedrals, as well as the glorious abbey of Mont St-Michel, although many of the towns were shattered during the Battle of Normandy. These days Normandy is an enticing blend of old and new. Fishing boats jostle with designer yachts in the harbour of Honfleur; contemporary restaurants and chic boutiques sit alongside half-timbered houses and Gothic churches in Rouen; and the reconstructed centre of Caen is a short drive away from the cobblestones of Bayeux. Whether it’s browsing the Normandy fish market, mixing with the high-rollers at Deauville and Trouville, or strolling the D-Day beaches north of Bayeux, this is one part of France that will stay with you long after you leave for home.